High blood pressure is the number one risk factor for death in the world. It is beneficial to have your blood pressure down around 110/70. Those eating a plant-based diet naturally have a reading in this range. vegetarian diet (eggs and dairy were included) cut their risk of high blood pressure by 55%. Those who ate a strictly plant-based diet cut their risk by 75%. Foods that are high in potassium, like bananas, ground flax seeds (a few tablespoons possess one of the strongest anti-hypertensive effects of plant-based foods) and watermelon offer the greatest protection against high blood pressure. I have linked this video before, but I believe everyone needs to watch this more then once. It is a little over an hour long, but its well worth it! This should give you plenty of great information to enjoy during the Holidays. The aroma of the holidays to me is cinnamon. Cinnamon has been used for medicinal purposes for thousands of years. Ceylon, known as true cinnamon and of higher quality. Cassia, the more common variety of today, found in the majority of products. strips that can ground into powder. The distinct smell and flavor comes from the compound called Cinnamaldehyde. This compound is responsible for most of it's powerful effects on our health and metabolism. * It is loaded with antioxidants which protect us from free-radicals. * It is highly anti-inflammatory and helps to fight body infections and repair tissue damage. *It may cut the risks of heart disease by lowering cholesterol, triglycerides and blood pressure. *It helps to improve "insulin sensitivity", by helping insulin to transporting blood sugar into the bloodstream. Which helps in controlling Diabetes. *It helps to inhibit buildup of a protein called Tau, which is contributes to Alzheimer's and Parkinson's disease. * Cinnamaldehyde has anti-fungal and antibacterial properties and inhibits the growth of certain bacteria such as Listeria and Salmonella. coumarin. You should to try to limit your use of this common variety and get "Ceylon"
It is available in powder, sticks and oils at your local health food store or online at cinnamonvogue. Don't worry unless you are using it on everything you should be fine. Here's a great way to start or end the day. I could eat broccoli everyday. collards, bok choi, mustard etc. This diverse group includes plants that the leaves, flowers, stems and roots can all be cooked and eaten. They are the most commonly eaten plant group worldwide. Broccoli is inexpensive and can be found at just about any grocery store. Broccoli is a great source for the antioxidants vitamin C, beta-carotene and quercetin. Broccoli is rich in calcium, making it an excellent vegan source of the nutrient that supports strong bones, which prevents osteoporosis. been shown to prevent oxidative stress, stimulate the immune system and reduce cancer growth. They are anti-fungal, anti-bacterial and help to eliminate toxins from our bodies. preventing heart disease and managing diabetes. The best way to eat broccoli is raw. Cook or steam it for only about 5 minutes to retain its nutrients. to reactivate the glucosinolates, so to get all the health benefits. I believe I'm going to steam some right now with a little Earth Balance and garlic! From Project 431, here's a great motivational video: Be Hungry(Fight for It). 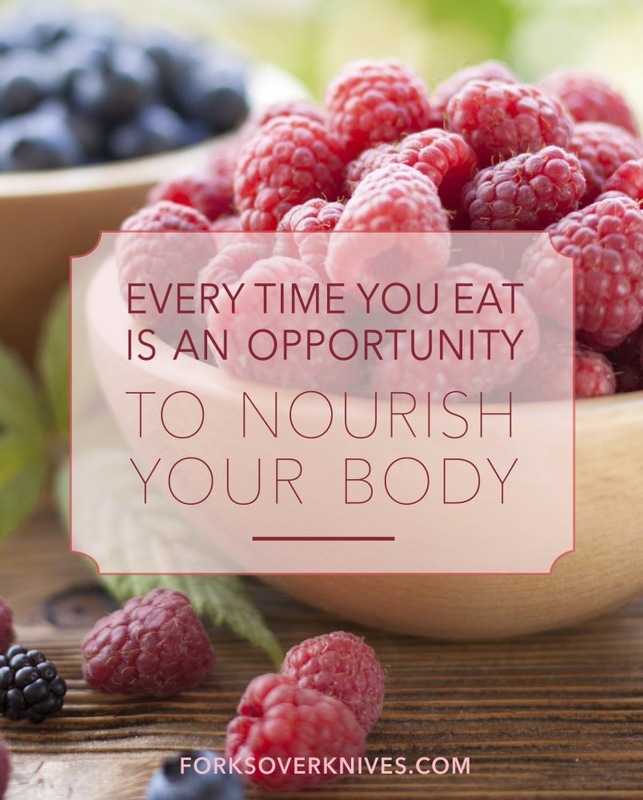 Nutrition is truly the cornerstone of our health. and even our cells and microbiome is made up of what we eat and drink. When we look in the mirror that's we see- all the things we've eaten. and greens smoothie you had for breakfast. Or was it that double bacon cheeseburger and fries with a "diet soda". Which one do you want to be made of? 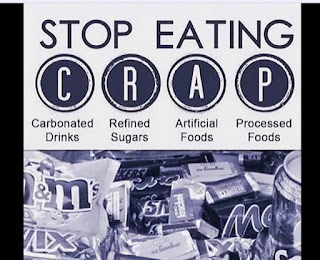 keep downing the junk we consume, knowing it is doing us harm. We know better. No other animal does that. Think about that. 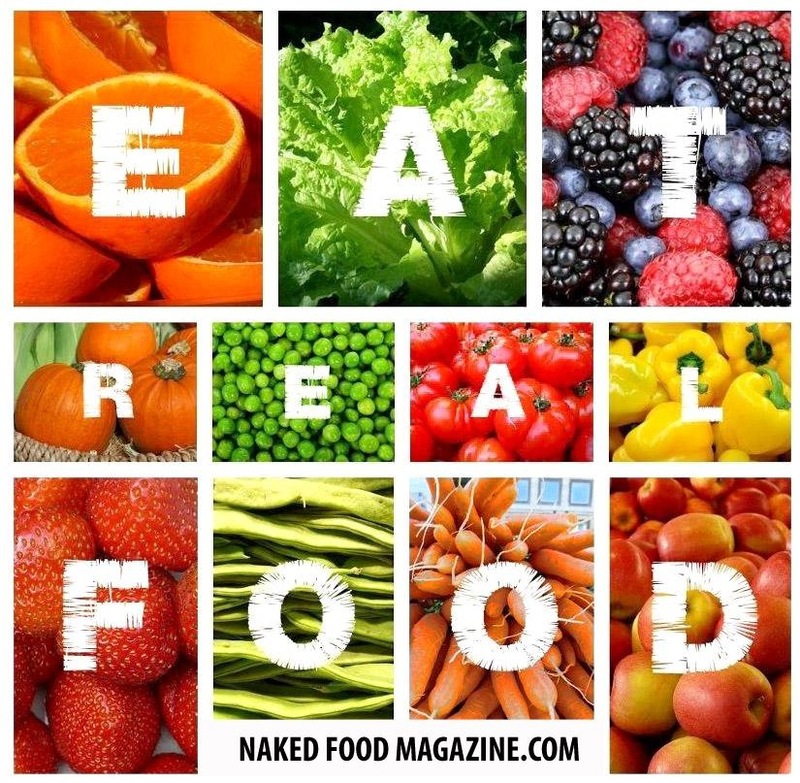 The food we consume is so much more than "fuel". Our bodies use every part of the food we eat. Macronutrients- proteins, carbohydrates and fats. and brain function and red blood cell production. ex: Phytochemicals- flavornoids, phenolic acids. None of these nutrients provide fuel, but are definitely needed for total health. When we lack any nutrients and minerals our body doesn't work properly. decrease the risk of heart disease and reduce overall mortality. These are all found in berries, broccoli, kale, garlic, onions, colorful veggies, etc. brain to let it know what is coming in. Don't fool your brain with junk food. seeds,grains,sprouts and healthy fats. Eat a lot of it raw. Let sit in fridge a couple of hours or overnight. Top with granola, coconut flakes or more fruit. This is the last of the series on gut health. Kris and I just got back from a week of visiting relatives in Arizona. Route 66 in Donkey Town. Good times! I know these podcasts are sometimes long, but they are well worth the time invested listening. and there really can be no debate about that"
which is mostly indigestible, so it functions as fiber. Avocados: Nutrient bombs! Eat them everyday. 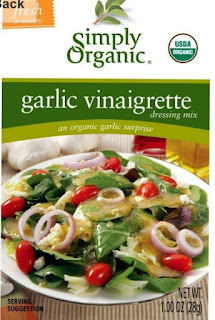 Allium vegetables : onions, garlic, chives etc. Dandelion greens: It also makes a great tea. Apple cider vinegar: also has many other benefits. Here are 2 informative videos by Dr. Michael Greger M.D. caused by animal agriculture. Watch: Cowspiracy available on Netflix. consume either provide good or bad bacteria for our digestive system. Antibiotics, excessive sugars, and even stress can kill naturally occurring good bacteria. This leads to inflammation, food allergies, skin issues and even mood disorders. Probiotics are live, friendly bacteria that are naturally present in our intestinal tracts. They maintain our digestive and overall health. from foods that contain probiotics. *Kimchi is simply pickled cabbage or veggies with a bit of spices. It has been a staple in Korean diets for thousands of years. Read here for more benefits of Kimchi. Miso soup. Check out the health benefits of Miso here. *Yogurt is the most well known probiotic fermented dairy product. Non-dairy yogurts are also available. produce the same benefit; they will actually cause more harm than good to the gut. and is much like a drinkable yogurt. system by fighting inflammation and improving lactose digestion. You can find some non-dairy alternatives here. protein, vitamins, minerals and plenty of probiotics, and it takes on whatever flavor you are cooking with. Check out our "Tempeh Reuben Sandwiches" in our recipe section. store, make sure its organic! (Non-organic is loaded with sodium-benzoate.) Here is a recipe for Raw Vegan Sauerkraut. This a link to one chapter of Dr. Garth Davis' new book "Proteinaholic". of the WHO's report on processed meats' link to cancer. then read "Proteinaholic", chapter 13. The number one cause of death in the U.S. is heart disease. can power our heart with "dirty blood", which leads to disease and death. From the ancient wisdom of Hippocrates; "All disease begins in the gut"
Here are five ways to transform your body's health. *Skip processed foods that leak endotoxins into your blood. In contrast, people who eat a plant-based diet mostly have "clean blood"
*Eat more fruits and vegetables to fight cancer. it capable of killing prostate cancer cells. 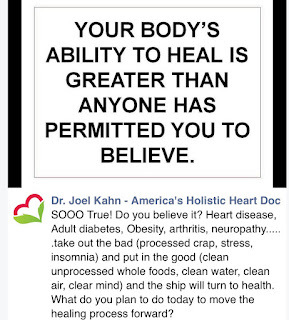 Their blood cells literally became "chemotherapy"
*Eat more fruits and vegetables to heal your arteries. 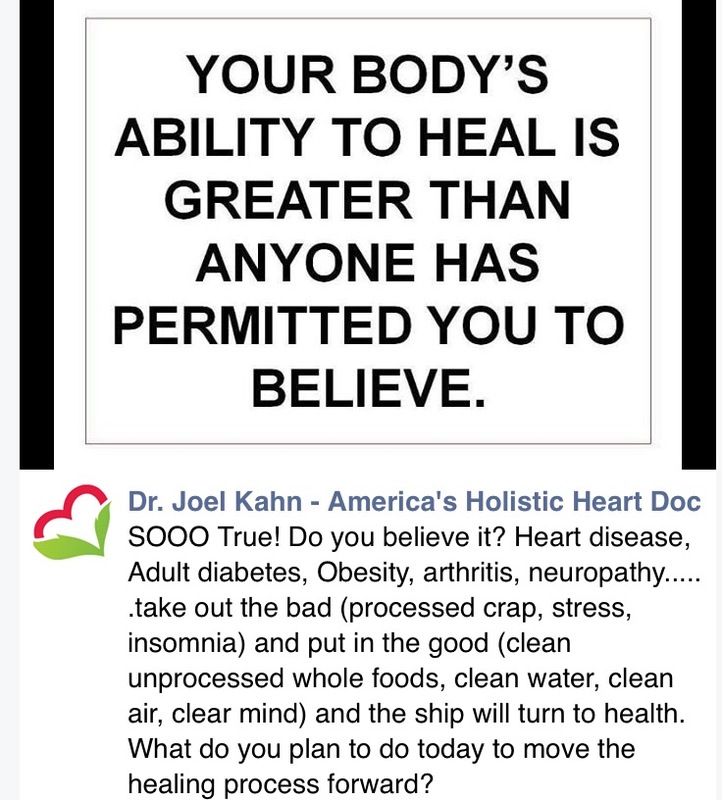 off those genes and turned on those genes which favored healing and health. Our heart and arteries are innocent bystanders of the blood we bathe them in. sleep can transform your health! 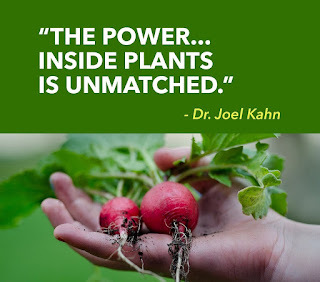 This information was from an article by Dr Joel Kahn. We have over 100 trillion microbial bacteria living on and in our bodies. For every human cell there is 10 resident microbes, making us more microbial than human. You could say we are super organisms! Our lifestyles and standard american diets are "starving" our good micro biome in our intestines. The overindulgence of bad diets( processed foods, junk food, sugar, meat and dairy, etc.) 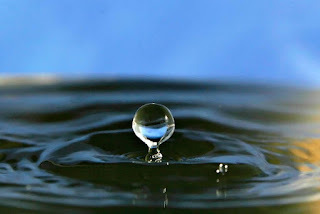 are depleting the good bacteria that keeps us healthy. In the process, it encourages the overgrowth of the wrong bacteria. The resulting imbalance makes us prone to disease, obesity, and negatively affects our metabolism, hormones and cravings. Even our immunity and genes our affected. 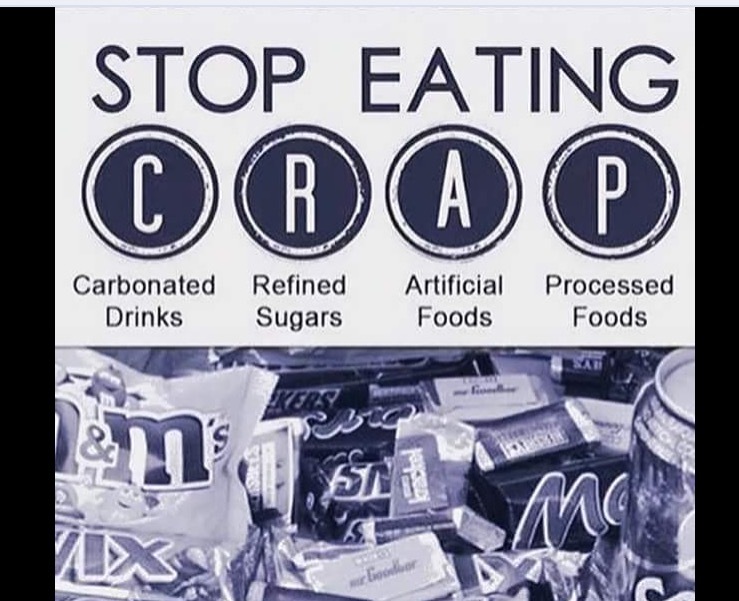 Processed foods, sugar(not fruit) etc. all cause inflammation and negative effects on our bodies. Chronic inflammation is involved in diseases such as diabetes, heart disease, stroke, cancer and much more. This type of food serves as "fertilizer" for pathogenic microorganisms and yeast, causing them to multiply rapidly. which are high in probiotics is best. Let's live a Super Life! Chia seeds are one of the oldest sources of nutrition. as 3500 B.C. Both for nutrition and medicinal purposes. salads, quinoa and veggie dishes. and even as an egg substitute in recipes. *They are typically Non-GMO, organic, and non-irradiated. most dairy products. They are also high in phosphorus,magnesium and protein. repair your cells and support a healthy digestive system. zinc,which promotes healthy skin, hair and nails. *They protect your heart. One tablespoon of chia provides 100% of RDA for omega-3 ALA.
Omega -3 helps to lower cholesterol and maintains proper artery function. *They are gluten-free and are great for lowering blood pressure and inflammation. If using dates, soak them in water for about 30 minutes. Pour in chia seed gel and blend on high. Place in serving bowls and chill for 2 hours or devour immediately! There will be no post next weekend. Our son and I will be in Atlanta participating in the Atlanta Spartan Super. Here's two quick and easy lunch ideas with very little prep time needed. 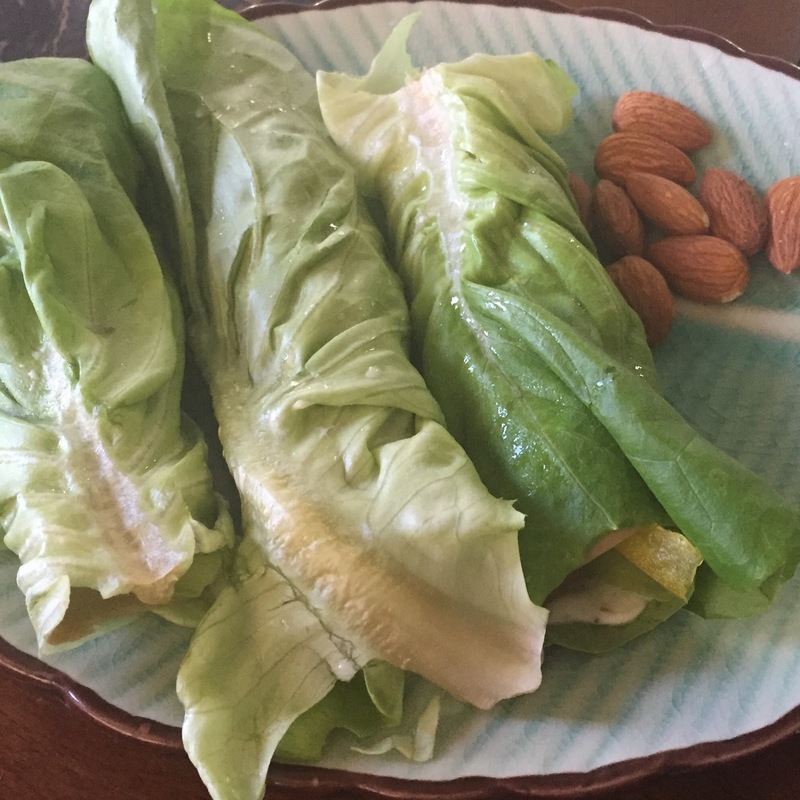 This afternoon, Kris wanted Asian inspired lettuce wraps. She already had some colored bell peppers sliced, so it was a quick fix. Several Butter or Boston lettuce leaves, rinsed. 1 slice each of green, red and yellow bell pepper. 1 slice oven roasted "Tofurky." A mixture of Just Mayo and dried dill. Add whatever else you like. Avocado, red onion, water chestnuts etc. 1-15 oz. can of chickpeas. 1/2 cup of diced green, red and yellow bell peppers. 1/4 cup of diced sweet onions. Mash the chickpeas or put them in a food processor for a few seconds. 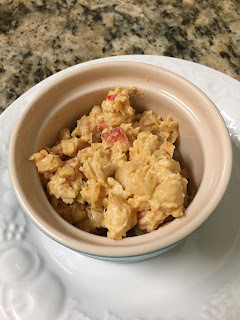 Stir until the consistency resembles tuna salad. I had mine on sliced homemade whole wheat bread with Organic Romaine lettuce. Jackfruit is the largest tree-borne fruit in the world — one fruit can weigh between 10 and 100 pounds and contain hundreds of seeds that are rich in protein, potassium, calcium, and iron. The fruit known as a jackfruit is being hailed as a "miracle" crop that could save millions from starvation. You can follow this link for more information. Here's my favorite recipe using jackfruit. With the right seasonings, you will think you are eating pulled pork! You can find canned jackfruit at your local Asian Market. In a large skillet, on medium heat saute onions and crushed garlic. Stir until onions are clear. Add lime juice, maple syrup and Bragg's. Add spice mix and fruit, stirring to completely for good coverage. The fruit will start to brown and liquid will dissolve. Ready to roll into a burrito with black beans and salsa or guacamole. Serves well with sweet potato fries. Add sauce to cooking fruit and spices and simmer until ready to eat. Serves well on toasted buns, with coleslaw made with "Vegenaise or Just Mayo". up to 14% of adults in the U.S. had diagnosed or un-diagnosed type 2 diabetes (2011-2012). don't even know they have it! From what I understand, research shows that our diet and lifestyle determines the chances of developing type 2 diabetes. consume on a daily basis. It will change your outlook on the healing power of food. for the short time we were there. We will now be making more trips north! Transfer to airtight container and freeze for 2-3 hours. You can add some rum if desired! Over the next several weeks I am going to be blogging about our "Gut Micro-biome"
then 100 Trillion bacteria! The microbiome in our intestines effect every aspect of our lives. including health, moods, risks of diseases etc.. According to studies, plant based diets are the best way to have a healthy micro-biome. It's been a busy week and it's not going to get any slower for the next few. in Lexington, Ky. We are so proud of her! Kris and her have been busy prepping for the move on August 21st. "11 great reason to eat less meat". talk about his epic accomplishment "50/50/50". Have a great week and be kind! 1 cup of diced fresh strawberries, blueberries or raspberries. In a glass bowl mix/stir all ingredients. Store in an old jelly/jam jar in refrigerator. This what "Sprite" ought to be! 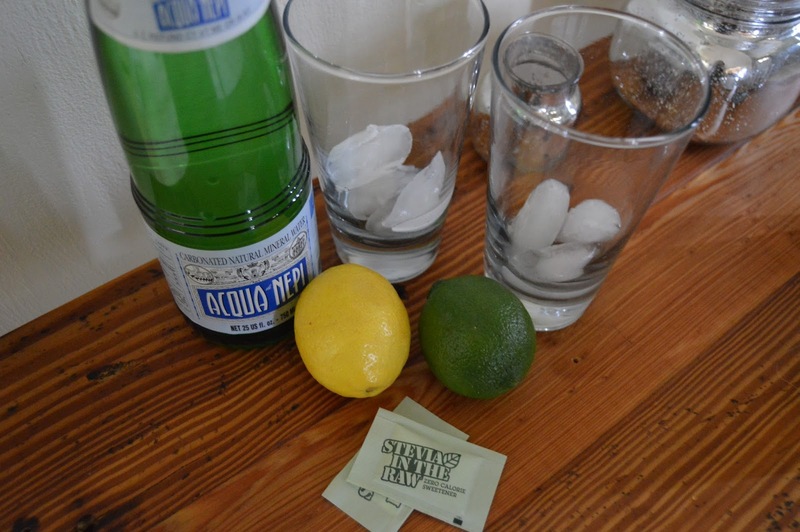 Squeeze 1/2 lemon and 1/2 lime and 1 pk of stevia into a tall glass. Add ice and enjoy refreshing "Sprite"
The benefits of apple cider vinegar are amazing! everything from skin issues, stomach ailments and even diabetes treatment. (Note: last week while at work, I was stung by ground hornets at least 10 times, I applied ACV to the stings. The itch and pain wasn't as intense!) Check out: Apple Cider Vinegar Benefits. Here's a easy morning drink recipe to start your day. 1 heaping spoonful of fresh or frozen berries. "Muddle" the fruit with the back of a spoon. Add 1/2 to 1 tbs of organic apple cider vinegar. Stir and fill with chilled filtered water. You can add Stevia or honey to taste. Have a great week and be kind. Here's a quick and energizing lunch or light dinner recipe. Quinoa is a quick-cooking, gluten-free grain known for its amount of protein. of colors, but most commonly in white(fluffier), while red and black have a crunchier texture. Prepare the amount of Quinoa you want according to directions. When it's done, set aside and let the Quinoa cool. Rinse and drain a 15 oz.can of chick peas. In a small skillet, heat 1 tbs of olive oil. Stir until well coated and warm. Stir kale until coated and wilted. The kale will wilt and shrink as it warms. In a large bowl combine Quinoa, Kale and top with spiced Chick peas. I always add sliced avocados on top! My daughter creates a delicious Cold Raspberry Sorbet Lemonade with hers. Back on June 7th I did a post on Iron Cowboy James Lawrence. He was attempting to do 50 Ironman distance races in 50 consecutive days in all 50 states. Yesterday July 25th he did it!! Most everyone loves dessert, and most love waffles. When the weekend comes, family breakfast choices change from oatmeal, multi-grain cereals, or fruit bowls to something different. Like, breakfast tofu/potato scrambles, or blueberry pancakes, etc. I believe dessert can be eaten at any time of the day! This morning we had dessert waffles. You do need a waffle maker for this recipe, but you should have one any way. This is a good excuse to purchase one. put a small metal bowl and whisk in the freezer for about 20 minutes. Put all in the chilled metal bowl and whisk until creamy. Melt it in a double boiler, stirring constantly. I use a recipe from "Thug Kitchen"
slowly stir in milk, oil and cider vinegar until blended. Pour mixture on iron and cook accordingly. covered with ganache and a spoonful of whipped cream! Add walnuts or whatever else you want. Just to let you know, you can enjoy these any time of the day! Watermelon, cucumbers and iceberg lettuce are all 90-95% water! Eat your Water. 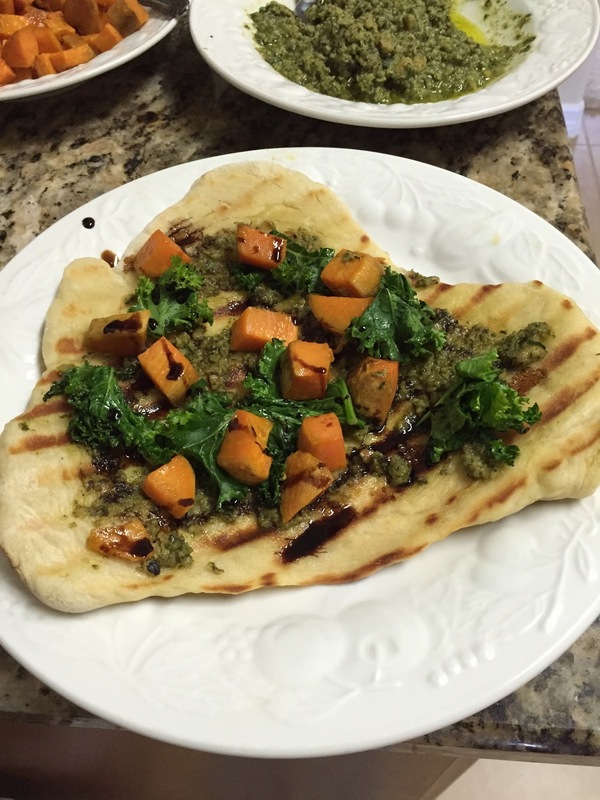 If you haven't heard of Chef Chloe Coscarelli, you had better get with it! She is the author of 3 cookbooks and is opening a new vegan restaurant this summer in NYC. She was a winner of Food Networks Cupcakes Wars in 2009. She creates the most healthy, amazing vegan dishes you will ever taste! 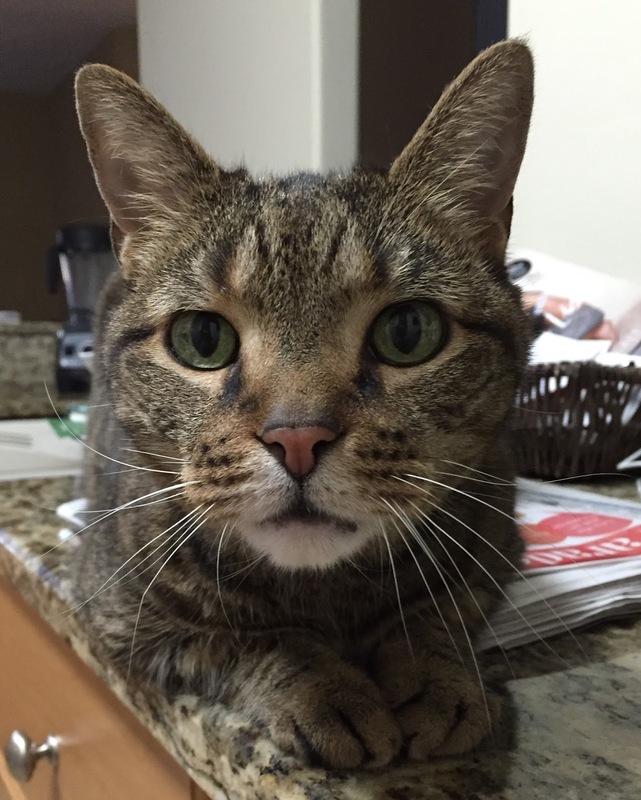 Our household is a big fan of hers, and love to create her delicious recipes. A few years back a movie called Julie & Julia, starring Meryl Streep and Amy Adams, was about a blogger who wanted to recreate every recipe in Julia Childs first cookbook and blog about it. Inspired by that movie, Kris and Briana are on a mission to prepare every recipe in Chloe's first cookbook, Chloe's Kitchen. It has been great, because I love to eat! Our usual pizza recipe is Chloe's BBQ Pineapple Tofu Pizza, which is awesome! as much Bree and I do, but she couldn't get over how flavorful this pizza was. It just might take over 1st place as our pizza choice. We use Chloe's recipes on a regular basis and highly recommend them to everyone. Since 4th of July is next weekend, I thought I would share a recipe that is all about watermelon. You can have this as a salad or dessert. 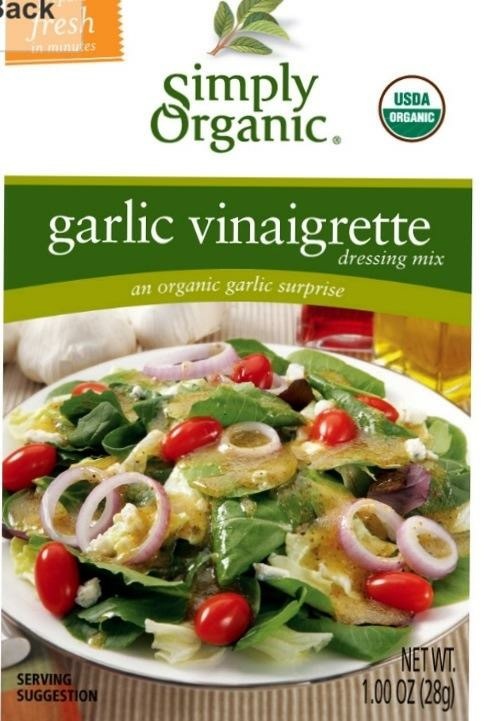 We make a quick dressing with "Simply Organic" garlic vinaigrette. You should be able to get this at any supermarket or health food store. A quick dressing recipe from Gwyneth Paltrow. whisk together mustard, vinegar and maple syrup in a bowl. slowly drizzle in olive oil. the sweet watermelon, it makes for a delicious blended flavor. Here's a link to benefits of arugula: Food Facts. Slice a chilled watermelon into 1-1/2" to 2" thick slices. 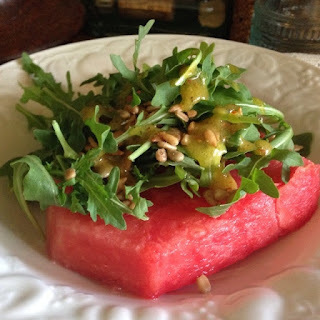 Top with a hand full of Arugula, sunflower seeds or pine nuts. Drizzle with a small amount of dressing. Quick, refreshing and very nutritious. Sweet Potato Kale Pesto Pizza! A few weeks back we bought a waffle maker. I love it! 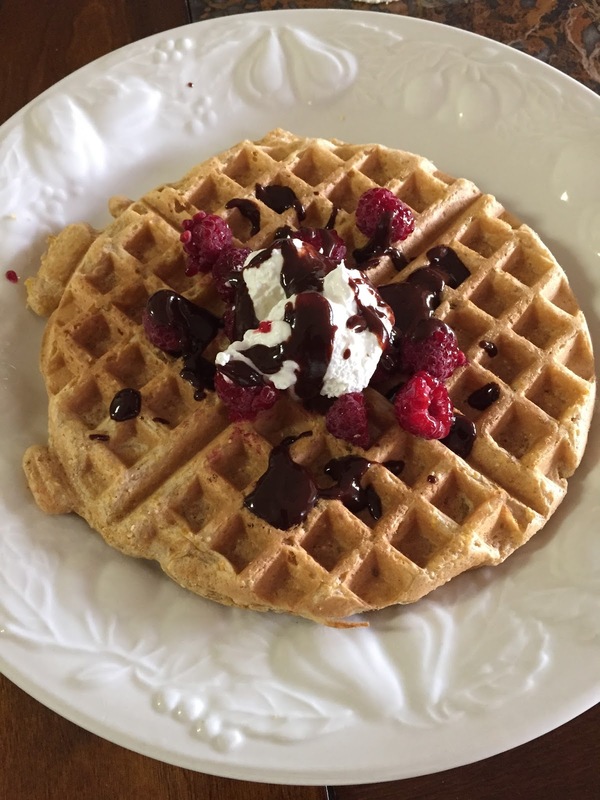 I found a waffle mix recipe in Thug Kitchen Cookbook, that is easy, taste great and is nutritious. If you haven't seen or heard of this awesome cookbook, please check this video trailer. Mix together the "milk", vinegar and oil in a small bowl. In a large bowl, mix all dry ingredients and form a "crater" in the middle. Whisk all together until smooth. Heat up your waffle maker, coat the plates with oil. Pour in some batter and cook according to your waffle maker. This mix makes approximately 5-6 waffles. 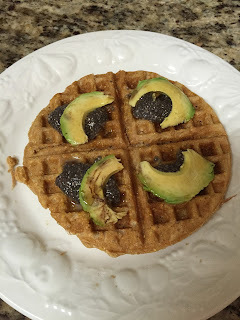 Today, I had Earth Balance Spread, with chia seed gel, sliced avocados and maple syrup!